Student Government Association’s Student Publications is hiring Graphic Designers for a paid position. This is an on-campus job open to all full-time FSU students. Position fills quickly, apply soon. 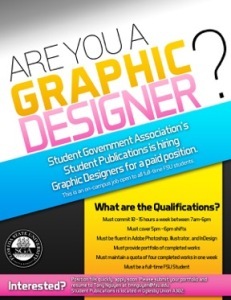 This is a paid, part-time position for any students seeking a job in Graphic Design. Position is 10-15 hours per week, and will be on-site during office hours, Monday-Friday 7:00 a.m. – 6:00 p.m. Students draft their own work schedule. Applicants must be able to cover 5:00 p.m. – 6:00 p.m. shifts. They must also be fluent in Adobe Photoshop, Illustrator, and InDesign. A portfolio and resume must be submitted to Tony Nguyen at tmnguyen@fsu.edu. Applicant will need to meet a quota of four completed works in one week. Open to full-time FSU Students. Position fills quickly, so apply soon.